Well this week the weather was dreich and so I only got out on the Dahon once. Fortunately, I didn’t get rained on. Saturday was different with bright sunshine but I had a lot on. Up early, I started with a baking session and here are the results. 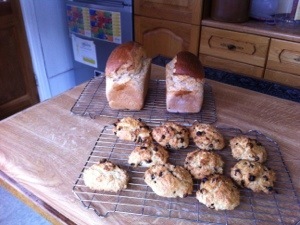 Here are rock buns and 2 loaves of bread. I had almost finished son’s Aran cardigan but needed an open ended zip for it. DH had cut his hand requiring a hospital visit and stitches so wasn’t able to cycle with me. I decided to cycle to town on the Dahon do a quick unfold and I was on my way. I cycled through Albert Park along past the lake . I left the bike on the cycle centre at the bus station and walked along to Boyes to get the long open ended zip. It was just too nice to not have a bit more of a ride so I followed the cycle route through the industrial area and onto the river path. I came across these beautiful berries on a tree that I’m not too sure what it is. 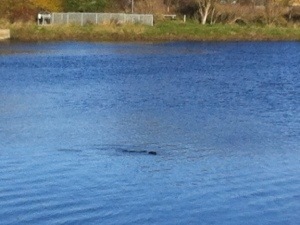 I enjoyed the ride along the river and was so pleased to see 2 seals . I tried getting a photo but just managed this poor attempt . In the afternoon, we drove up to my home town where my GN was being baptised by her father. She looked to sweet I’m the dress her mam was baptised in. I haven’t put a photo of her as I didn’t ask permission and I don’t know how to blur her face in the photo. She is 8 yrs old and this is the minimum age for such an ordinance . We also went to Costco to stock up while we were up that way. A busy but lovely day, despite me having to do all the driving. I love rock cakes and those look delicious, Yum! Hope hubby’s hand is Ok and didn’t hurt too much. His hand is healing but he will have quite a scar as the cut was jagged and they have pieced it back. Fortunately there was no nerve or tendon damage . It has begun to feel itchy and we always used to say that is a sign of it knotting together . Don’t know of that is true though . Managed to get the Aran jacket all finished and it looks good. Have resumed work on the Norweigan one for myself. Hope you are doing OK as I haven’t seen anything on your blog for a while. Your Loaves and Rock cakes do look good Brenda…..
Ooh, I hope husband’s hand is soon Ok. Mine is always doing some damage with cutting metal such a lot. I love your bread and rock cakes. 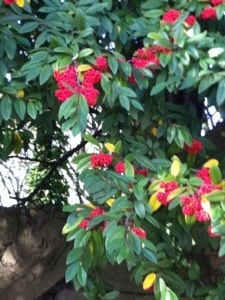 I saw those berries on a tree close to where I live, noticed it whilst talking to a friend’s brother outside her house. No idea what it is though. His hand still isn’t healed although the stitches have been removed. There is a slight infection but he goes back to the GP on Monday. He did make some bread buns today but mainly using his left hand. With homemade soup they were great. When on the Dahon to the bank DS1 came with me on his bike so I didn’t have to lock it up. Bike theft is rife around here and I don’t want to take any chance. Hope you are doing well. I think that tree/bush is Sorbus Commixta, Japanese Rowan, which is rather a useless piece of information. Very nice though, with the lovely berries and deeply marked leaves. There are a number around where I live. Hi Ann Marie lovely to hear from you. 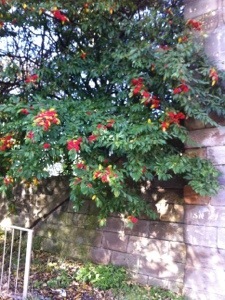 I thought it was a Rowan of some sort so thanks for the info.Much appreciated.